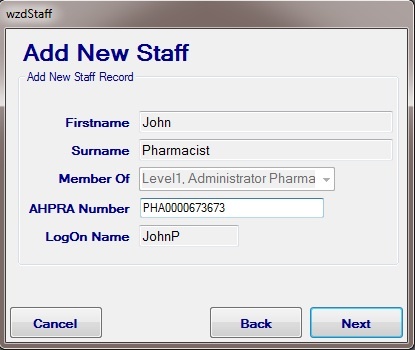 Only a Level 1 Administrator can add staff to the EasyDose system. 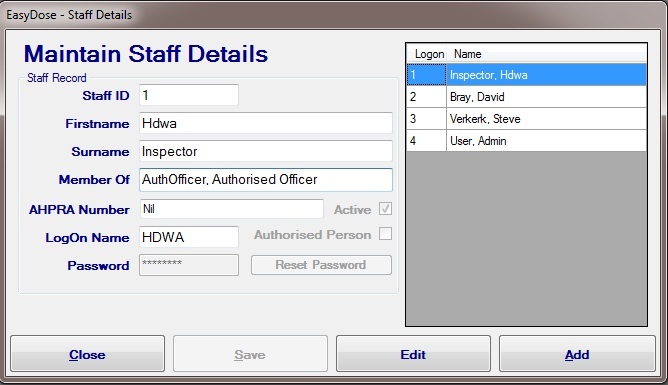 The Maintain Staff Details Form can only be accessed from the drop down menus on the Main Menu > Users > User Details (Add/Edit Staff). 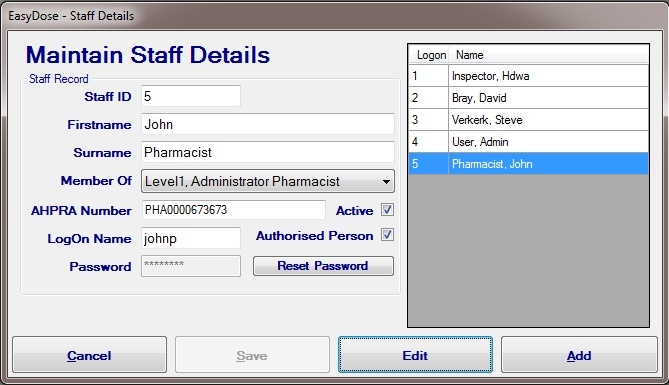 The Maintain Staff Details Form is a split form, the left showing the fields which require entry against each person and the right showing a summary list of the users currently entered into EasyDose. User details can be edited by selecting the user in the list and then clicking ‘Edit.‘ Note, the Staff ID, LogOn Name and Password cannot be changed. The password however can be reset to ‘password.’ If the password is reset, the user will be required to change it the first time they log on. Further, a staff member who is no longer employed at the pharmacy or whose access to EasyDose needs to be suspended, can be set to Inactive. 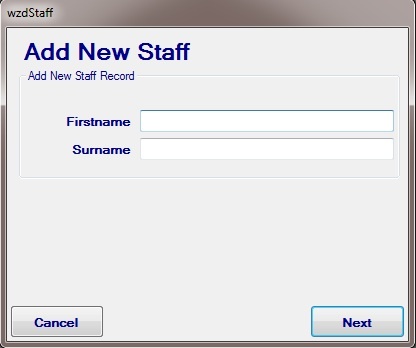 This removes the user from any staff drop down lists preventing them from logging on. It is a Health Department requirement that users cannot be deleted. 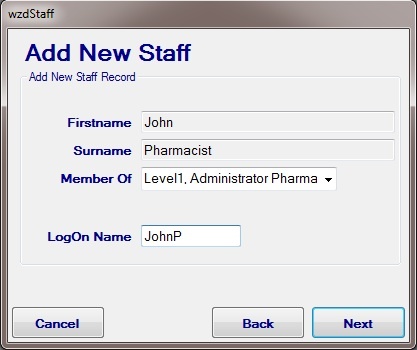 Adding staff is performed by a wizard which is activated by a Level 1 Administrator clicking the ‘Add‘ button. The following form requires the First Name and Surname to be entered. NOTE: The names should be typed in Proper Case. 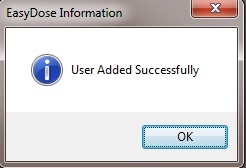 After entering the names, click ‘Next‘ which allows the user to allocate a security level to the new user from the ‘Member Of‘ drop down box. There are 3 selections applicable to staff. The LogOn Name must be unique and cannot be changed once saved. 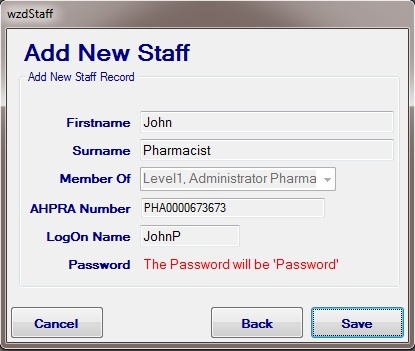 Next, will allow the staff member’s AHPRA number to be entered. AHPRA numbers can be accessed here. Saving the record will provide the following confirmation. The newly added staff member is set automatically to Active. An authorised person can be allocated or changed from this screen. NOTE: An authorised person is required by the Health Department and is deemed to have overall responsibility for the EasyDose system and records. Confirmation will be received that the change has been made. Repeat this procedure for each user. Users 1 to 4 cannot be deactivated or modified.